“WAS IT AS GOOD FOR YOU AS IT WAS FOR ME”?? 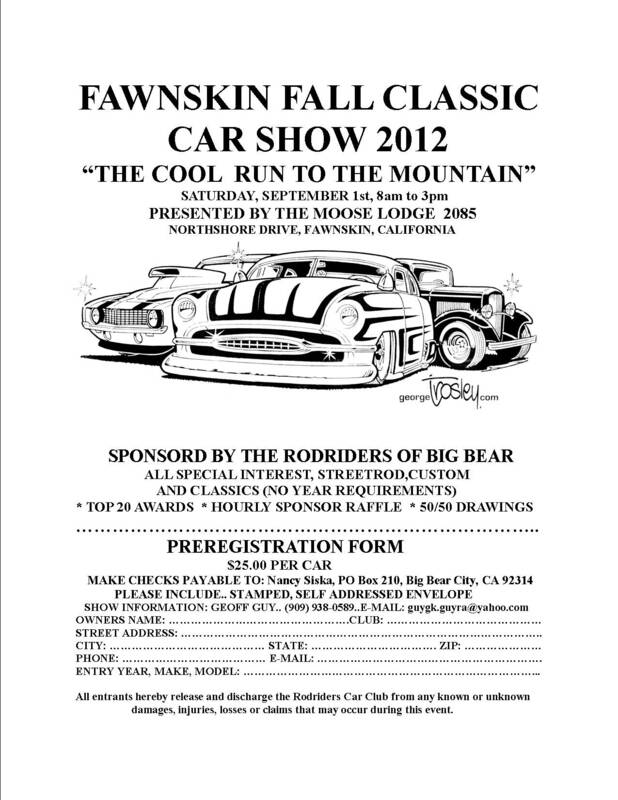 YES SEEMS TO BE THE ANSWER..THE FIRST ANNUAL CRUISIN TO STOP BUISIN” CAR SHOW IS “IN THE BOOKS” AS A SUCCESS.. 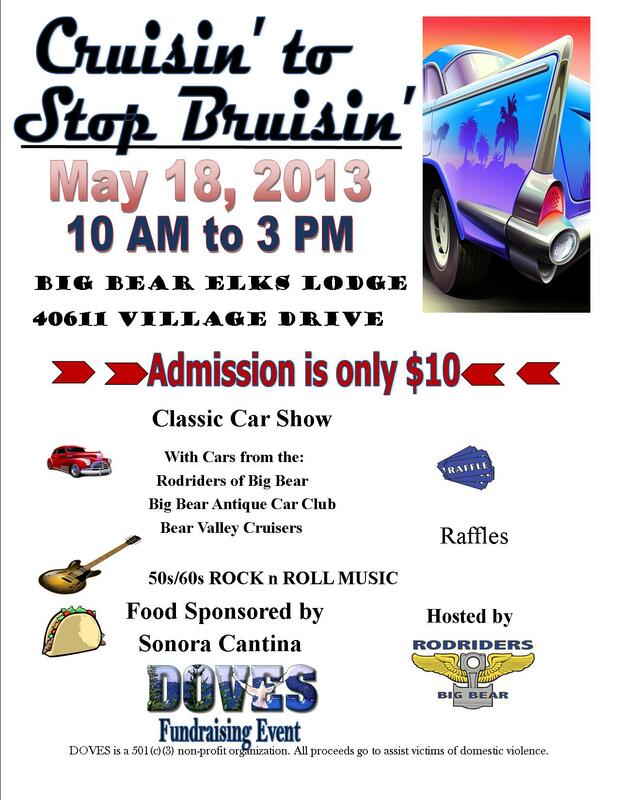 THE RODRIDERS OF BIG BEAR WILL HOST THE “CRUISIN TO STOP BRUISIN” CAR SHOW AT THE ELKS LODGE IN BIG BEAR LAKE ON MAY 18th.. 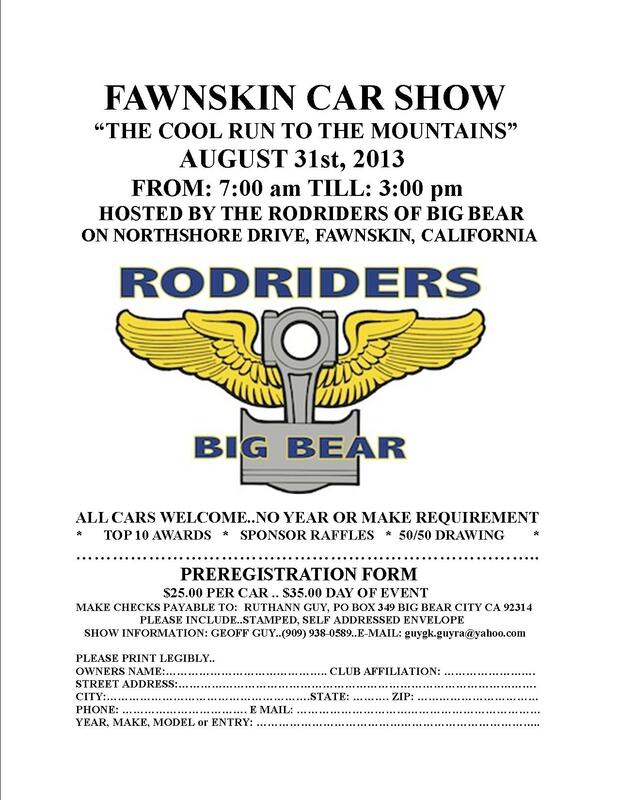 MANY OF OUR LOCALS HAVE WORKED TIRELESSLEY TO MAKE THIS SHOW AN ANNUAL EVENT THAT THE DOVES ORGANIZATION WILL BE PROUD OF..LARRY HUFFMAN HAS MADE AN APPEARANCE ON LOCAL TELEVISION AND HAS GONE THE EXTRA MILE BY DOING A 30 SECOND COMMERCIAL ON OUR RADIO STATION “KBHR”..OTHERS ARE WORKING BEHIND THE SCENES COLLECTING RAFFLE ITEMS FOR SATURDAY’S EVENT..THE “BEAR VALLEY CRUISERS” HAVE OFFERED THEIR SUPPORT AND WILL BE PRESENT “IN FORCE” SATURDAY MORNING..MANY MEMBERS OF THE BIG BEAR ANTIQUE CAR CLUB WILL ALSO BE PRESENT..ALL PARTICIPANTS WILL HAVE FREE ADMISISSION AS WELL AS EATS PROVIDED BY SONORA CANTINA.. THOSE WHO PLAN ON SHOWING THEIR CARS ARE REQUESTED TO DROP OFF A RAFFLE ITEM AT THE DOVES CORPORATE OFFICES IN THE SUMMIT PLAZA..
1302 Car Show 2013THE FIRST CAR SHOW OF THE YEAR IS THE DOVES CAR SHOW IN THE ELKS PARKING LOT IN BIG BEAR LAKE ON MAY 18th AT 10am TO 3pm..THE CARS FROM ALL 3 CAR CLUBS: BEAR VALLEY CRUISERS CAR CLUB.. BIG BEAR LAKE ANTIQUE CAR CLUB..AND THE HOST..RODRIDERS OF BIG BEAR CAR CLUB.. 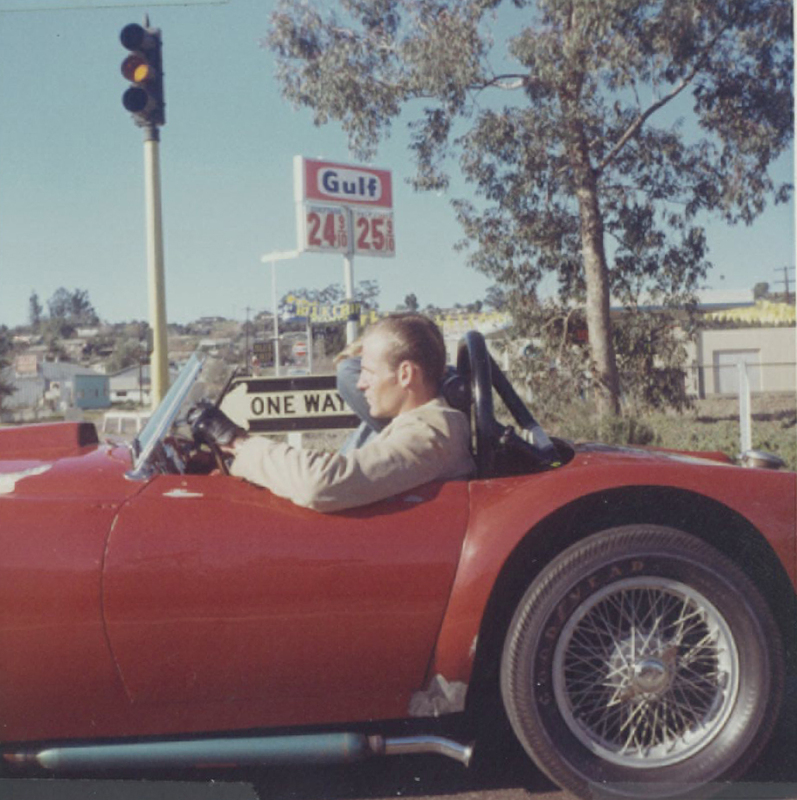 TITLED “CRUISIN TO STOP BRUISIN” IS HELD TO SUPPORT “DOVES” A NON-PROFIT DOMESTIC VIOLENCE SUPPORT GROUP..
EVERYTIME I START A PROJECT PERTAINING TO AUTOMOBILES..I HEAR MY FATHERS VOICE..”YOU DON’T HAVE THE MECHANICAL ABILITY..YOUR AN ARTIST”.. ARTIST YESSS..!! IT IS ART TO VISUALISE HOW YOU ARE GOING TO ACHIEVE A GOAL..WHETHER IT BE MECHANICAL OR LINES ON A PAPER..
FOR THE LAST WEEK I HAVE BEEN TRYING TO VISUALISE THE REMOVAL OF THE ENGINE OUT OF MY ECONOLINE PICKUP.. DETERMINATION..NO FEAR..AND YES ART GOT IT DONE.. SO THERE DAD.. AN ARTFULL REMOVAL I MUST SAY..!! FORGOT HOW FUN THIS IS..!! 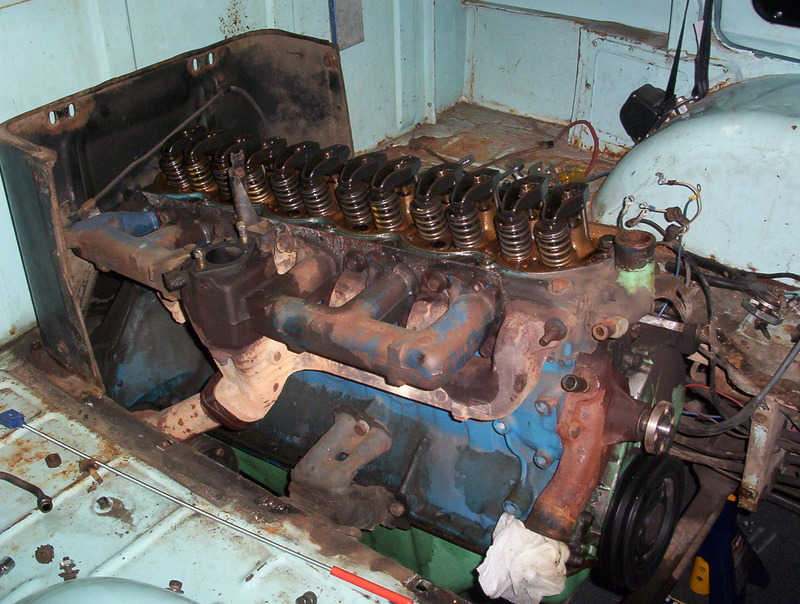 HERE IS A PICTURE OF THE CAB OF THE ECONOLINE JUST BEFORE THE ENGINE IS REMOVED..
WITH THIS KIND OF VEHICLE THE ENGINE HAS TO REMOVED THROUGH THE PASSENGER DOOR..!! TOOK A LOT OF TIME REMOVING ALL OF THE PERIPHERAL HARDWARE, BUT I AM READY TO “HOIST” HER OUT AND DO A REBUILD.. GOING TO TRY AND BRING THE HORSEPOWER UP OVER 200.. 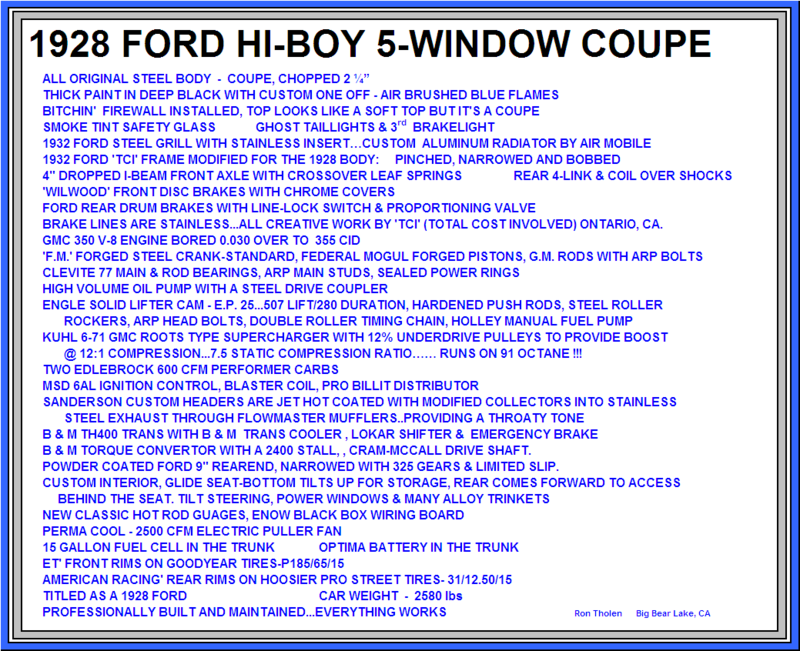 I KNOW MOST OF YOU ARE SHAKING YOUR HEADS..SAYING WHY A “INLINE SIX”..?? 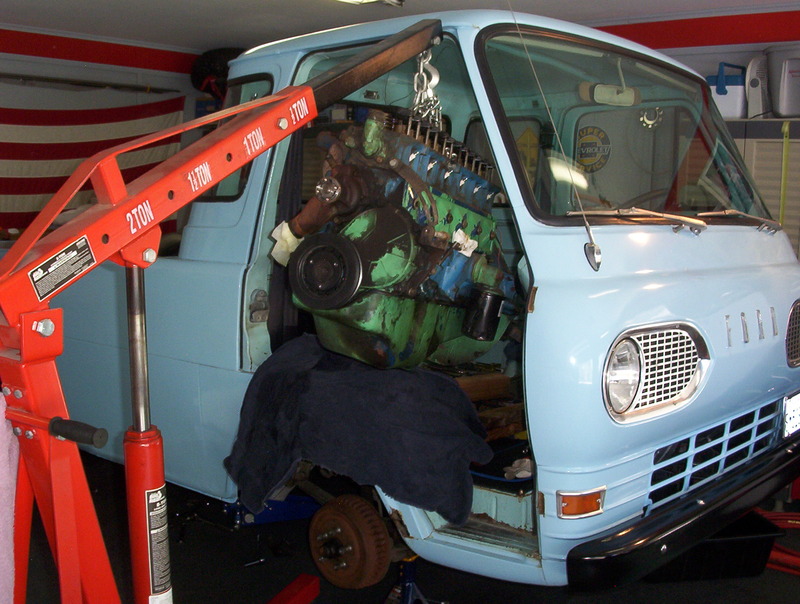 I THOUGHT I MIGHT GIVE OUR BLOG A TRY..SEEING THAT I HAVE EXHAUSTED MOST OF THE MORE ECONOMICAL SOLUTIONS FOR GIVING MY BELOVED 67 ECONOLINE PICKUP A NEW HEART.. THE ENGINE IN THIS GIRL IS A “BIG BLOCK” 240 STRAIGHT SIX..WHY THEY CALL A FORD STRAIGHT SIX A “BIG BLOCK” IS BEYOND ME..!! WHAT I WOULD LIKE TO DO IS REPLACE THE 240 WITH A 300 (INSTANT INCREASE IN POWER)..